Coir (coconut fiber) is a completely natural byproduct of the huge coconut growing industry of the island of Sri Lanka. Coir is an excellent growing medium for all kinds of containers and baskets. 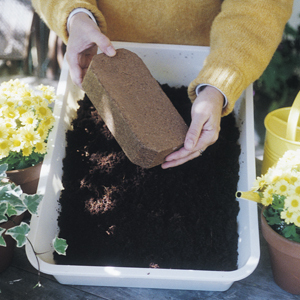 Improves other potting mixes when you blend them together. It retains plenty of moisture, but is very porous which allows for good air circulation and healthy root development of seedlings and cuttings. It is sterilized for freedom from weeds and plant pathogens. 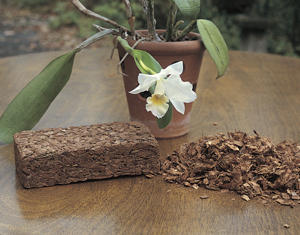 New coir chip bricks are made entirely from natural coconut husks. They are better for orchids because they hold more water, air and nutrients than bark chips and do not dry out as quickly. Yet the open chip structure allows air to circulate just as well as with bark. Coco husk chips contain five times more lignin than bark, so they are highly resistant to breakdown. Compressed bricks are 2" x 4" x 8" and weigh 1.1 lb. each. Soak them in water and let them expand for 15 minutes before use. 100% organic and bio-degradable from renewable resource (coconuts).